I’m reading Fire Within: St. Teresa of Avila, St. John of the Cross, and the Gospel-On Prayer by Thomas Dubay. I was hungering for something to help me advance in prayer and spiritual maturity and this has been an excellent book at the perfect time in my life. One section covers St. Teresa’s writings on interior mansions. As I reflect on some of the stages and the hallmarks of each, I feel compelled to write down the times in my life when God spoke to me directly. They won’t make much sense to anyone else but hopefully writing them down will help me to make more sense of them and where they fit into the interior mansions of my life. I have heard God speak to me twice. Neither was an audible sound, and both were unmistakable – they weren’t from my own thoughts. In fact, at the time my thoughts were frantic and racing and pouring out fear and sorrow to God and the instant He spoke to me I stopped, was still, and knew it came from God directly to me. The second time God spoke to me I was in a hallway outside my dad’s ICU room. It was a time in my life when many different people were causing me to question what I’d been taught and were insisting “this” doctrine or “that” doctrine was essential to salvation. As the doctor and team worked on my dad after he coded, I was frantically praying and cried out to God, “How are we supposed to know? Catholics say ‘this,’ Baptists say ‘that,’ Karen believes a completely different thing. Did he do the right thing or believe what he needed to, to be saved?” Immediately I heard the LORD: “Oh, Lori – I am so much bigger than all of that!” Again, I was immediately still and I knew it was true. All of my fear melted away and I felt great peace. I was able to sincerely thank Him for my dad, and surrendered my dad into His loving hands. Other very different and distinct events have occurred that are hard to describe but as I read St. Teresa’s accounts, I know the first is an experience others have had. I was awake but in bed. Suddenly I realized a wonderful light was growing. I’m not sure if my eyes were open or closed, but all I saw was this light getting brighter until it filled everything, was everything – all I saw was the brilliant light. My heart nearly exploded with joy and I knew it was Jesus! Nothing was spoken, it did not last long, and soon it was just me in my bed again feeling great joy and smiling until it almost hurt! It felt like a promise to me. I’ve never doubted it was the LORD and I was in His presence, a momentary lifting of the veil. I wasn’t sure what to make of it; I have simply pondered it in my heart and treasured the moment. The last event was again the presence of the LORD. I was driving on a beautiful spring day across Iowa, conversing with God out loud. I looked across the landscape, a quilt of fields with young crops of corn and soybeans and I said, “That is so beautiful, LORD! My dad would love this drive today, looking at the crops.” Immediately I felt a burst of light or energy and I absolutely knew that somehow, in some way, my dad was with me. More than that, I knew the LORD was intimately present as well and I burst into tears. The gift was knowing my dad was present, but all my words and attention and gratitude were directed at God for giving me such a wonderful gift. I felt such great joy! It didn’t last long but stayed with me the rest of the trip and again, I have simply been left to ponder it and treasure it. I am intrigued by St. Teresa’s interior castles. I know these experiences fit very well into what she described, and her own went far beyond my own. Not long ago I read about Moses speaking to God face-to-face and I covet that greatly! Every step I take seems to both feed me, and leave me hungering for more. I continue to pour out my heart to God, begging Him for more. Not more “experiences,” necessarily, but more of Him. Driving in this morning I realized I was annoyed with someone else and was running an argument through my mind – an argument I will never voice out loud, but that I was allowing to play out in my thoughts. God has done a lot of work within me, helping me to let go of anger and frustration and to grow a deep-seated peace in my soul. But I know there is more work to be done as He continues His good work in me and helps me to grow in holiness, and my thoughts are something He is working on with me. I have been longing for and praying for a deeper relationship with God; an intimacy like Moses shared with Him, face-to-face. I desire to grow in spiritual maturity and to know Him more. So if my body is a temple (1 Cor 3:16 and 1 Cor 6:19) and the Holy Spirit dwells within me, it makes sense that I need to continue “cleaning out” the temple, making it a holy place where God will dwell more fully. I am smiling – I knew what I desired, I just wasn’t sure how to get there. But wouldn’t you know? God is showing me, guiding me, teaching me. Abba Father, please take captive my mind! Help me to keep it on things above, that which is beautiful and holy and You. Help me to stop wallowing in a place of judging others, accusing … even if it is only in my mind. I want my mind to be a holy temple dedicated to You! I don’t have the power to make it so but You do! Please continue to help me, guide me, teach me! When I was in the midst of my dark night of the soul, I was searching for new ways to pray. I felt so dry and unable to pray well on my own and many novenas and pre-written prayers felt unnatural to me – my mind wandered, I couldn’t focus well, and often I felt that praying was a waste of time … it was simply a rote exercise without feeling or weight. I was pleasantly surprised. It was not difficult, it didn’t feel burdensome, and I enjoyed the reflections each day. Since the accompanying prayers were only a decade of the rosary and not an entire rosary, I found I was able to be focused and reflect as I prayed without my mind wandering. As I have repeated this novena over several years, many prayers have been answered. Many knots in my life large and small have been worked out, some in very surprising ways. I have been very blessed by it. Recently I read that Pope Francis enjoys this novena. I can only smile at that – how funny! Many people have never heard of it and it has been somewhat obscure, but now it is growing in favor. I had found the novena online and created my own pamphlet to follow. 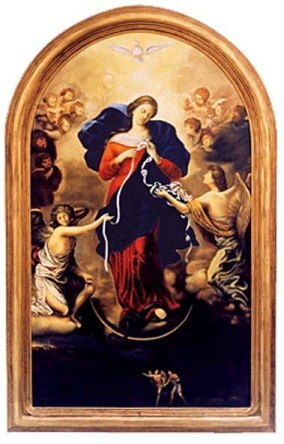 Here is a free copy of the novena, Mary Untier of Knots. Simply click on this link, and print it front and back. This will give you a tri-fold pamphlet to use yourself. May God bless you through this novena as He has blessed me! whoever finds one finds a treasure. I love that passage. It always makes me stop and reflect on the friends who have been woven in and out of my life. Each one an enormous blessing, each one a certain season in my life. For many reasons, the last 10 years have been solitary years for me outside of family. And I have been completely content with that, feeling that the LORD has been leading and teaching me 1-on-1, and it’s been wonderful! Sometimes events in others’ lives make me stop and wonder if I am wise to be so isolated, though. After Tonya’s accident, a friend stayed in her house with her for several days to take care of her. With Amy’s cancer, I see the fruit of years of friendships built in a small community as people have come alongside in support for the entire family. Very honestly, if something happened suddenly to my husband, I can’t think of a single person I would call to be with me. Is that a good thing, or not? The idea doesn’t trouble me greatly. But I do miss the friendship I had with Karen during my short time in North Carolina. It was honest, equal, mutual, and God-centered. I really miss having someone to talk with about God – to ask questions, to reflect together and seek answers together. I think God used us each for the other to challenge and support and to help us grow. For a time I found a certain level of that online on Christian messageboards. People challenged me and taught me and I did develop real friendships. But I am weary of the constant adversarial nature, and I find myself longing for someone in-person. LORD, it is in your hands and in your timing. I would be blessed to have a friend again to share this part of our journey, if you so will it. And if you want me to remain in solitude and lean on you alone, I’m ok with that too. I trust your plan completely and my heart’s desire is to grow closer to you. However you will bring that about, I thank you! Faithful friends are beyond price, no amount can balance their worth. Faithful friends are life-saving medicine; those who fear God will find them. Praying for others – what difference can it make? Do you pray for others? Do you sometimes wonder if it really makes a difference? Can one person’s prayer and sacrifices even bring forgiveness to others for their sins? When Jesus saw THEIR faith – not the man’s faith who was paralyzed, but the faith of his friends – Jesus forgave that man his sins! Never give up; never stop praying for your loved ones. We may not always see tangible results from our prayers in this life, but over and over the LORD has shown me how powerful prayer really is. At mass, we often sit behind a couple who is older than we are – not “elderly” but probably retired. Several years ago I noticed that sometimes the wife seemed a little disoriented, unsure of what to do next or speaking to her husband at inappropriate moments. He would sometimes respond with irritation, frustration and impatience, shushing her or grabbing her elbow and re-directing her a little roughly. As time has gone by, her descent into dementia or Alzheimer’s has become more pronounced. As I’ve sat nearby praying for them, I wondered how it felt for him to watch his wife slip away, not knowing what would come next, what he was to do, what would become of them. I’m sure he felt frightened and alone sometimes. I’ve watched her slip away more and more into her trial of disease and illness. And I’ve watched him grow in holiness. It’s been a long time since I’ve seen any hint of frustration or impatience. Now, he is extremely gentle, guiding her into the pew, helping her to stand, speaking in her ear to calm her. I smile at the stubborn cowlick in her hair – unruly and always sticking up and I wonder if she would have been embarrassed to see herself like that, or amused. I wonder if he even notices it or if, like many of our husbands, he doesn’t really notice details of his wife’s hair. People stop to pat his shoulder as they pass by, and he turns to smile up at their friend. I am struck again at how we rarely are alone in our suffering or trials. What affects one, affects so many others. Tonight Father Jim offered a blessing for mothers, as tomorrow is Mother’s Day. He invited all the men to raise their hands over the women in church in blessing. I watched that couple as he gently laid his hand onto her head. She bowed her head at his touch, and I wept at the beauty of a man blessing his wife. I’ve been on the run all week with lots of little errands. Nothing of importance, just busy-ness. But my mind has been very still and focused, thinking of Carla and the trial she is facing. Her 26-year-old daughter Amy has been undergoing tests to formulate a treatment plan. Amy, mother of a 1-year-old son, has been diagnosed with an aggressive breast cancer. Generally when we raise our hands to God, it is in praise and thanksgiving. I believe it is so important to look and to see things worth praising and worth thanking Him for, especially in our trials. Even though this battle my friends have entered may be long, there is much to be thankful for and much for which to praise God. It’s already been a blessing to witness how many people have come alongside the family with thoughts and prayers and support. I think we all will be their Aaron and Hur, helping support their hands and keeping them raised to God when they grow weary. I read that passage the very morning my dad was admitted to ICU. I have sure pondered that a lot since then as God as led me through my own trials. I pray for my friends and for all people who are in the midst of great trial. I ask God to strengthen them and to use their trials to draw them ever-closer to His own heart. Open their eyes and hearts to recognize your blessings and your presence in their lives. Please send the Holy Spirit to strengthen their faith and to fill them with peace. And bring them Aarons and Hurs to help support them. In Jesus’ name, I pray.